Tyson began by explaining that flat-Earthers who live in the U.S. are allowed to say whatever they want, truth or not. Constitutional rights don’t make beliefs true, however. In a free country, it doesn’t matter if you think the world is flat, provided you don’t ascend to become head of @NASA. Tyson then turned his attention to the concept of what it means to be a pop star and, consequently, a role model. “If kids who are fans of pop-stars think Earth is flat because they do, then it exposes a flaw in the concept of Role Models,” the astrophysicist tweeted. If kids who are fans of pop-stars think Earth is flat because they do, then it exposes a flaw in the concept of Role Models. Unlike his past Earth-is-round Twitter rants, Tyson’s recent tweets didn’t appear to be in response to a freshly outed denialist celebrity. However, his comments do reflect another type of denialism that exists in a very influential place in America: the White House. Scott Pruitt, chief of the Environmental Protection Agency, doesn’t believe humans are the primary cause of climate change ― a view that contradicts an estimated 97 percent of climate scientists. President Donald Trump has called climate change a hoax and has proposed deep cuts to NASA’s budget for climate-change research in favor of space exploration. 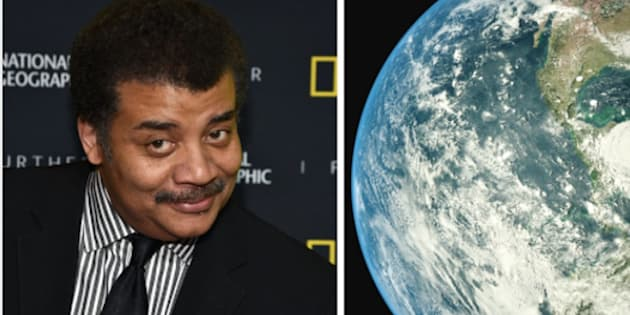 Perhaps, in honor of upcoming Earth Day and the coinciding March for Science protests, Tyson was pointing to flat-Earthers to make a case against policymakers who are also science deniers, and argue for science to have a larger role in government. In fact, Tyson’s flat-Earther tweets were posted after he published an essay titled, “Science in America,” arguing for just that. “Scientific truths emerge by consensus — not of opinion, but of observations and measurements — rendering the research that falls outside of consensus the shakiest possible grounds on which to base policy,” Tyson wrote in his essay. Show me a Nation with a science-hostile government, and I'll show you a society with failing health, wealth, & security.